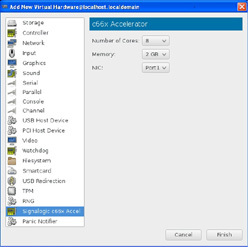 Information for software and 32-core and 64-core accelerators below includes specifications, documentation links, and technical support. Various vendors talk about GPU, DSP, FPGA, etc. but these are all "really hard to use" solutions. These vendors miss the point, trying to prove that servers are not traditionally good at streaming and image processing. Obviously servers are plenty good at running ffmpeg and image processing. What is fair to say is that trends in server architecture, including virtualization, DPDK, and software-defined networking, have increased performance expectations of individual servers. In the past HPC users were willing to stack boxes; now due to virtualization, they expect one box to be a stack of VMs -- without penalties in performance, latency, and network I/O throughput. Signalogic's software and hardware acceleration products are designed to take full advantage of server architecture trends. They augment modern servers, providing well integrated functionality and user interface, as opposed to alternative, non-mainstream methods. 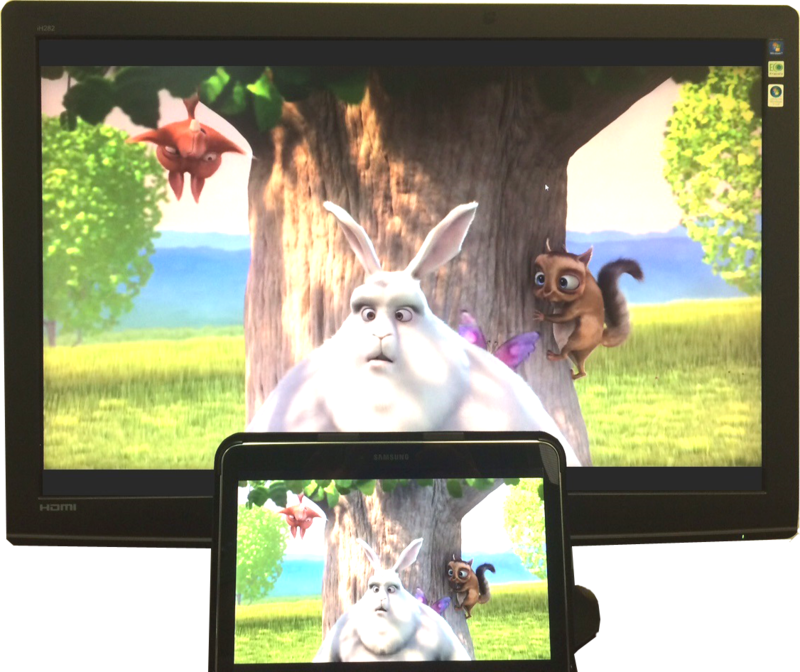 User interfaces include ffmpeg command line, opencv APIs, OpenMP programming, and VM configuration. Within the latter, our products add cores, DDR3 mem, and NIC resources that can be used both with/without virtualization. The result is improved server performance density, reduced latency, and increased stream concurrency, without having to use proprietary programming languages, study a 300-page chip vendor data sheet, work with low level "SDKs", or other time-consuming development efforts. Below are some example ffmpeg commands. 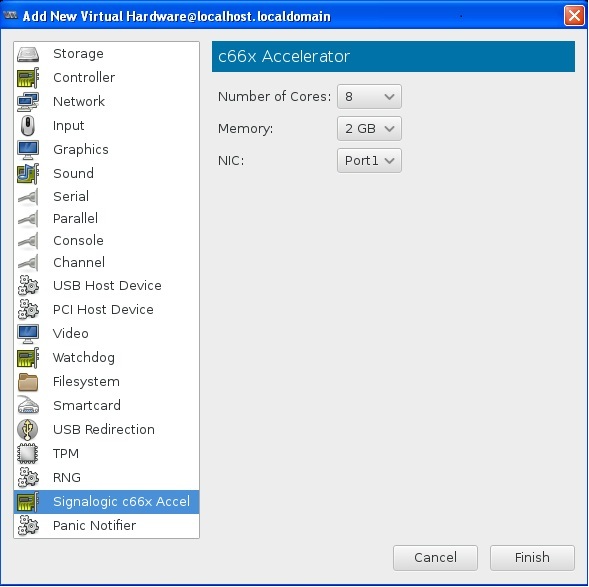 Adding the option "-hwaccel c66x" enables c66x hardware acceleration. Below is a software model diagram that shows how c66x CPUs are combined with x86 CPUs inside high performance computing (HPC) servers. The user interface varies in complexity from left to right, from simple (command line) to complex (OpenMP pragmas). Pragmas are compiled by the CIM® Hyperpiler™, which separates C/C++ source into "soure code streams" and augments streams with additional, auto-generated C/C++ source code. Multiple different applications can be run at the same time, as concurrent host processes, concurrent VMs, or a combination. 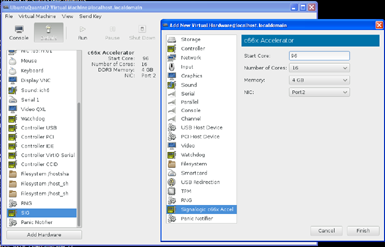 Adding DPDK capability to application user space is optional. CPUs tend to be good at complex algorithms that require random memory access, non-uniform treatment of data sets, unpredictable decision paths, and interface to peripherals (network I/O, PCIe, USB, etc). Neither of these devices is a "do-all" or panacea for complex computing, or somehow fundamentally superior to the other, as the marketing hype would have you believe. People tend to forget that top global semiconductor manufacturers are all on the same technology curve -- which of course makes sense, as they all use the state-of-the-art semiconductor manufacturing technology of our time. If you look closely at the two key factors that form the basis for Moore's Law, performance and power consumption (the chip metric is GFlops / Watt), you won't see much much difference between Intel, Nvidia, Texas Instruments, Xilinx, etc. What you will find are differences in corporate practice and marketing culture, ingrained over very long periods of time -- 30 years or more -- that makes one manufacturer or another more adept at serving certain market segments, with advantages (or disadvantages!) 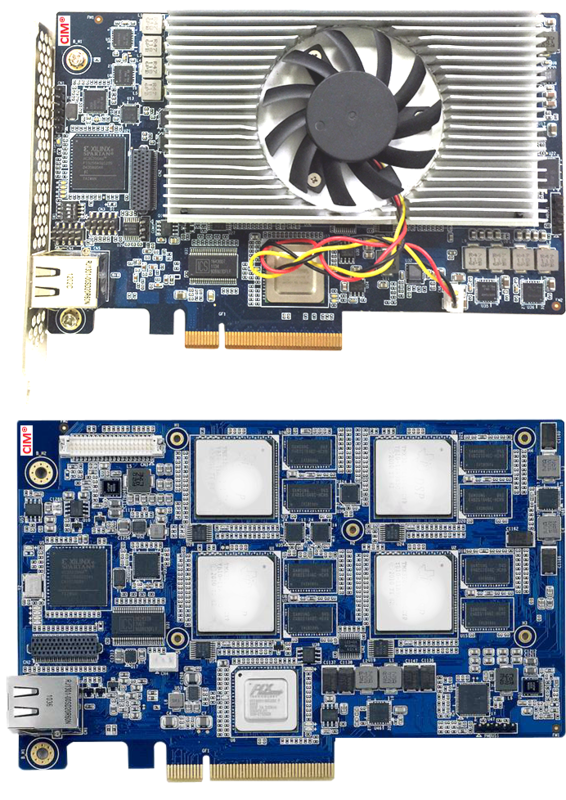 in package size, memory bandwidth, onchip integrated peripherals, programmability, etc. Below are simplified diagrams of CPU and GPU accelerators. c66x multicore CPU accelerator diagram (shown for a CIM-64 card, with 8 cores per CPU and 2 GB mem per CPU). All CPU cores have NIC access GPU accelerator diagram (shown for a Kepler 80 card, with 13 Streaming Multiprocessors (SMs) per GPU, 192 CUDA cores per SM, and 12 GB mem per GPU). A GPU can have literally 1000s of "CUDA cores"
A CPU accelerator typically has its own NIC (or more than one), which can provide advantages in reduced latency and "data localization" -- bringing the compute cores closer to the data. Onboard NICs are typically not found on GPU accelerators as GPU cores are not designed to run device drivers, TCP/IP stack, etc. Signalogic's engineering staff designs, develops, maintains, operates, and tests software and hardware in the company's in-house lab, using servers from HP, Dell, Supermicro, Artesyn, Advantech, and others, and Linux installations including CentOS, Ubuntu, Red Hat, Wind River, Gentoo, and more. 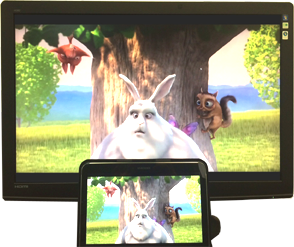 Streaming output is tested using Android and Microsoft Surface tablets with players including VLC, MPlayer, and others. Customers can submit technical questions via e-mail, phone, or Skype chat. Signalogic engineers are experts in server and embedded system development. Unlike retailers and distributors who offer analytics and video-related products, Signalogic can also perform contract development. Signalogic is a member of third-party programs for HP, Dell, Intel, and Texas Instruments. A high level of expert tech support is a distinct advantage when purchasing products from Signalogic.